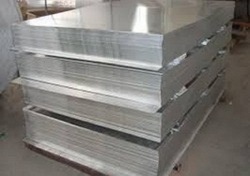 We are Stockists and Importers of Aluminium Alloy Sheets. Aluminum 1100 (19000) is soft, low strength and, at 99% aluminum composition, is the commercially pure grade among aluminum alloys. Kindly send your inquiries to sales@maharashtrametal.co.inAluminum 1100 (19000) is a soft material and is used to make many common household items, such as cooking utensils, household foil, and food containers. Aluminum 1100 is also used in a wide range of industrial applications, involving both thermal and electrical conductivity. Artists appreciate the ability to form shapes using stamps, engravers, and other light-weight tools. Aluminum 1100 is commercially pure aluminum. 1100 has excellent welding characteristics; it is also soft and ductile so is ideal for applications that require intricate forming as it works hardens slower than other alloys. 1100 is, however, non-heat treatable. As 1100 has excellent resistance to corrosion it is widely used in the chemical and food processing industries also for giftware and applications where eye appeal is important. Principal Design Features This alloy is commercially pure aluminum with excellent forming characteristics. Applications Commonly used in spun hollowware, fin stock, heat exchanger fins, dials and nameplates, cooking utensils, decorative parts, giftware, rivets and reflectors, and in sheet metal work. Welding Readily welded by all conventional methods. Use AL 1100 consumable electrodes and filler wire. Forming Forming, either hot or cold, is readily accomplished with this alloy. In the annealed condition the alloy can be cold worked extensively without an intermediate anneal. Machinability This alloy has very good machinability. Best results are obtained when machining is done with the alloy in hard temper. Carbide tooling is preferred, but high-speed steel tooling may also be used. For heavy cuts an oil lubricant should be used otherwise turning may be done dry. 8011A (AlFeSi(A)) Aluminum (40800)8011A aluminum is an alloy of aluminum, further classified as an otherwise unclassified aluminum. 8011A is the Aluminum Association (AA) designation for this material. In European standards, it will typically be given as EN AW-8011A. AlFeSi(A) is the EN chemical designation.It has eight common variants, each represented as a separate material. The Material Properties section below shows ranges encompassing all variants. For more specific values, follow the links in the Variant Materials section. Aluminium/aluminum 8011 alloy is a wrought alloy. 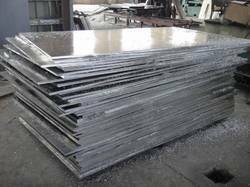 Our organization is dedicatedly involved in manufacturing, supplying and exporting a comprehensive range of Aluminum Sheets. Available in various dimensions, specifications, shapes, and sizes, our offered sheets are manufactured in compliance with the highest benchmarks of quality. Extensively used in various industries, these sheets are manufactured utilizing high-grade aluminum and other basic material. The following datasheet will provide more details about aluminium/aluminum 8011 alloys.Chemical CompositionThe following table shows the chemical composition of aluminium/aluminum 8011 alloys. The physical properties of aluminium/aluminum 8011 alloys are outlined in the following table. Aluminum alloys have strong corrosion resistance. At subzero temperatures, their strength increases, thus making them a useful low-temperature alloy. Their strength decreases if they are subjected to very high temperatures. The aluminum 7075 alloy has high strength. Owing to our sound infrastructure facilities, we are successfully catering to the requirements of our clients by bringing forth a uniquely designed array of Aluminum Alloy 7075. Designed and developed at our state-of-the-art manufacturing unit, these products are highly utilized for various applications. With the aid of sophisticated machinery and cutting-edge technology, our products are manufactured utilizing quality-approved raw material. The following datasheet gives more details about the aluminum 7075 alloy. The following table shows the chemical composition of the aluminum 7075 alloys. The physical properties of aluminum 7075 alloys are tabulated below. 7075 in the T6 condition has a machinability rating of 80% when compared to 2011 at 100%. Aluminum 7075 is can be formed in the annealed condition. and can be forged in the temperature range of 700 Degrees to 900 Degrees F. It should be solution heat treated following forging. Aluminum 7075 is a very poor choice for welding. Resistance welding is the only preferred method of joining 7075. Gas welding should be avoided and the use of arc welding may result in degradation of corrosion resistance. 7075 may be solution annealed at 900 Degrees F for 2 hours at temperature, followed by a water quench. The alloy may then be given a precipitation hardening (aging) heat treatment. Annealing is done at 775 Degrees F, holding for 3 hours at temperature. Controlled cooling at 50F per hour should then be used down to 500F from which it can be air cooled. Owing to our sprawling infrastructure, we are able to fulfill the requirements of our client by offering Aluminum Alloy 2024. It is a cold finished aluminum wrought product that has good machinability, surface finish capabilities, and deep drilling characteristics. Further, these products are ideal for applications requiring high strength and are manufactured in compliance with the international standards of quality. 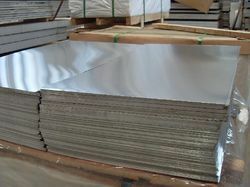 Looking for “Aluminium Alloy Sheets”?